Pressed every year on our farm in the New Forest. We use a combination of apples from our own local orchards as well as the more traditional cider varieties from orchards we work in Herefordshire and Somerset. 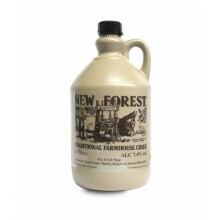 The result is a full-bodied blended cider, strong, still and un-pasteurised. Proper, vat-matured, scrumpy! Here are some tasting notes to use as a guide: DRY	- Very dry, full of flavour, deep tannins with a lingering finish. MEDIUM - A good all rounder, well balanced and very quaffable. SWEET -	Lightly sweetened. A full flavour cider. All Flagons are plastic. Cider 7.4%ABV.